As an expert in the field of card printing, Evolis knows the challenges and needs of the industry. With practical accessories Evolis gives you the opportunity to increase both turnover and profit. At the same time you offer your customers additional functions and possibilities for utilizing customised plastic cards in their daily business. 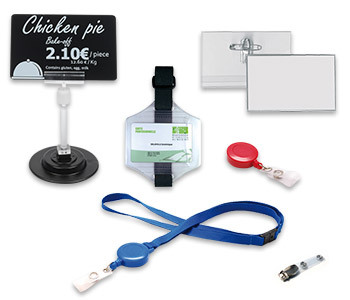 The offerings of accessories comprise different card holders, clips and lanyards for printed name tags and access cards, as well as various holders for the attractive presentation of price tags, especially in the food industry; not to mention cleaning sets and pens for the card printers.